Dimensions (HxWxD): 38" x 25" x 23"
The Swingline™ CX30-55 cross cut shredder is capable of shredding large documents due to its wide feed opening. Since it is TAA compliant, the Swingline™ shredder is suitable for purchase with government funds. The Swingline™ shredder shreds optical media, credit cards, staples, paper, and paper clips. Thanks to the advanced Jam Stopper® technology, the Swingline™ shredder clears paper jams by automatically reversing the paper. The Swingline™ CX30-55 cross cut shredder's thermal overload protection ensures the shredder motor doesn't get hot. 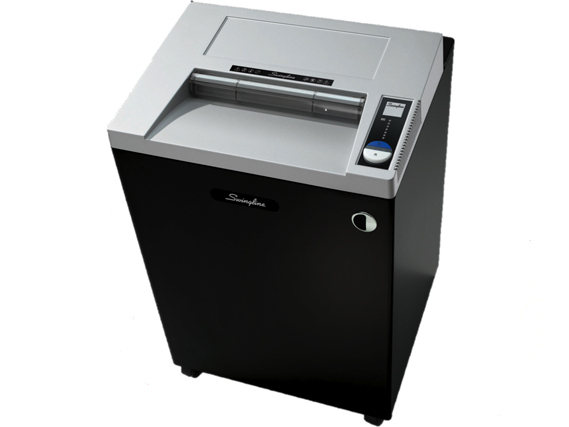 The Jam Stopper® shredder is a continuous shredding shredder; not needing any cooling. The Swingline™ CX30-55 cross cut shredder's waste bin is in a wire-frame configuration. When the bin gets full, the Jam Stopper® shredder's bag full indicator indicates it.